Hello everyone, we have some exciting news today, the first release of the Papilio Schematic Library is ready to go! Ever find that you need just one more serial port, or SPI master, or PWM? Wouldn’t it be nice to add any peripheral you could imagine to your microcontroller? Sigma-Delta audio DAC’s, Stepper Controller’s, Commodore 64 audio chips? 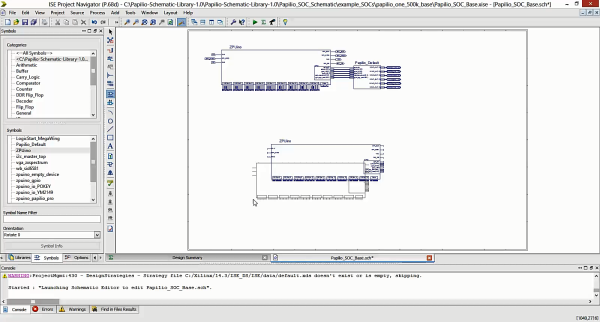 Well look no further, the power of the Papilio FPGA removes the limitations imposed by static hardware and the Papilio Schematic Library provides the building blocks you need to draw your custom microcontroller in a schematic editor! No more searching for a new board because you are one serial port shy of finishing your project, the Papilio can adjust to your needs, not the other way around. This entry was posted on Friday, November 1st, 2013 at 11:00 am	and is filed under library, releases. You can follow any responses to this entry through the RSS 2.0 feed. You can skip to the end and leave a response. Pinging is currently not allowed. A schematic based FPGA compiler? Like the one Xilinx offer? Well, the Xilinx offering is big [to download] and complex. If this is smaller / faster / easier, good luck to you. Oops – You need the ISE Webpack anyway. This is an extra overlay, using an Arduino compatible device library. Nice release. Cypress PSOC-Designer and Creator have been doing that for PSOC parts for several years already, but it gets complicated when more peripherals requiring specialty hardware (like high speed serial) is added to the mix.